Learn exactly what an Elliott Wave is and how to apply and use Elliott Wave theory in the stock market. We will use specifically the S&P-500. It will also share some realities about the theory. Who Created The Elliott Wave Theory? The Elliott Wave Principle was created by Ralph Nelson Elliott in the 1920’s and it is an inciteful look at how stock market prices move not in random distribution but in uniform recurring cycles. 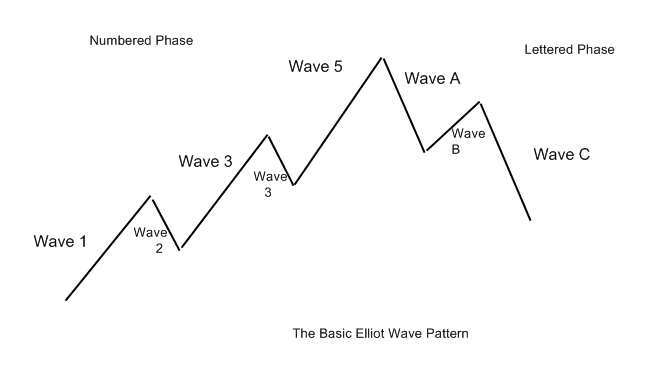 In Elliott wave theory the hypothesis suggests that any major market move is a cycle, and inside every cycle there 8 Waves. The “Cycle” could be classified as the first leg in a primary bull market for example. What is an Elliott Cycle? Like the business cycle, there are times of growth and times of decline, which are largely attributed to the macroeconomic situation, specifically monetary and fiscal policy. An Elliott Wave cycle could be the first bull market in an economy emerging from a recession for example. Or it could be the second bull market after a market retracement during a strong overall economic revival. Wave 1: Impulse Wave – the initial start of a new bull run. In a bear market recession, it is the initial push downwards from an all-time high. Wave 2: Corrective Wave – this is the correction from the Wave 1 when stocks pull back from the new high. Wave 4: 2nd Corrective Wave – another move down in stock prices as sellers cash in on their profits. Wave 5: 3rd and often longest Impulse Wave – the market is strong and the bulls decide it is time to buy. Wave A: 1st Wave of correction of the primary cycle – the market participants become nervous at the new highs and begin to cash in their profits, however, buyers are not keen on these prices so the stock prices start to fall. Wave B: 2nd Wave of correction (pull back of corrective move) – as stock prices begin to fall, buyers start to outnumber sellers and the stock price starts to rise. Wave C: Correction of primary wave completed – now the bears win, the market participants are nervous and everyone starts to sell and there are few buyers. This completes the cycle and we start from Wave 1 again. Using Elliot theory is not an exact science and one does need to use a little imagination (squint your eyes, tilt your head), however, it does prove useful for reference. In this example, we apply Elliott Wave Theory to the emergence of one of the best all-time Bull Markets in history – 2009 to 2018. The chart below is the exact bottom of the 207 to 2009 financial crisis bear market. Chart 1 TeleChart2000 chart courtesy of Worden Brothers, Inc.
As you can see here this S&P move is actually classic textbook Elliott Wave. In 2013 the U.S. markets had hit new all-time highs and seem to be happily advancing despite lackluster economic data. This example shows how to apply Elliot Wave theory both to the end of a bull market and the beginning of a brand new baby bull market. Chart Courtesy of Worden Brothers Inc. In this chart, I have mapped approximately the main 3 waves of Elliott Wave Theory. The first impulse wave starts in March 2009 and ends in May 2010. The second impulse wave starts in July 2010 and ends in May 2011. The third impulse wave starts in October 2011 and is continuing until May 2013. 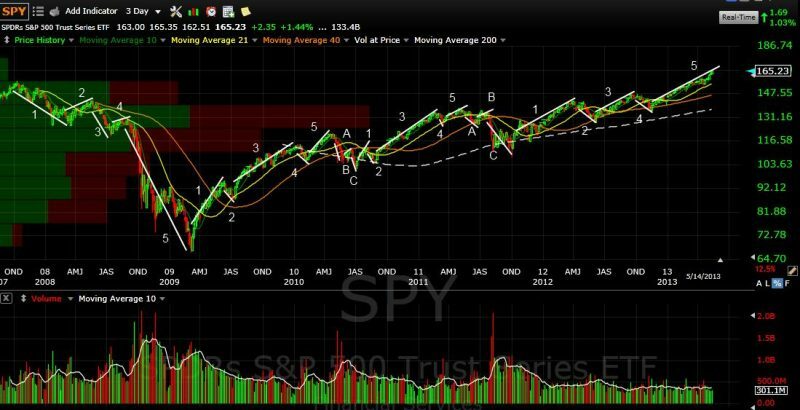 Elliot wave theory suggests that major bull markets propel upwards in 3 primary waves. After the third impulse wave, we then see a primary downward trend bear market, to set us up for the next round of impulse waves up. The problem with Elliott wave theory is that the mapping is always open to interpretation and ask 10 Elliott wave theorists the same question you may get 10 different answers. But assuming my mapping is correct we could be due for a major down move in the market. When will that occur? Well, this is the key question. The final impulse wave is normally the longest according to the theory, and in this instance that certainly holds true. There are some caveats with the Elliott wave theory. The first is that it is proven accurate and statistically relevant only on highly liquid stocks or markets, where there is less likelihood manipulation of prices by a “few strong hands”. Elliott himself warns us of this. This means that the not so liquid elements of the market are not applicable; approximately 65% of the total market. The main Elliott Waves with examples. The key here is the ability to zoom in and out on different timeframes to spot the waves. intra-day minute by minute charts, or long-term multi-decade charts, there wave are usually perceivable. I literally scratched the surface of Dow Theory and Elliot Wave Theory. I would strongly recommend you understand these concepts. Technical Analysis of the Financial Markets John J. Murphy 1999. Previous articleWhat is a Hedge Fund & Should You Invest in One?